Interest Income from Loans grew by 9% to total $70.38 million relative to $64.28 million reported in the same period of 2017. Interest Income from Banks and Other Receivables amounted to $86,185 in 2018 as compared to $1.25 million in the last financial year. Interest Expense totaled $5.63 million relative to $6.33 million in 2017; this represents a 11% decrease. As a result, Net Interest Income grew by 10% to total $64.83 million (2017: $59.20 million). Commission Expense grew by 10% to $966,976 (2017: $880,129). Foreign Exchange Gain totaled $141,226 (2017: $1.23 million), while Other Income amounted to $35 (2017:11,081). Consequently, Net Profit for the quarter amounted to $9.15 million relative to $8.25 million in 2017. As a result, EPS closed at $0.087 (2017: EPS $0.079). The 12-month trailing EPS is $0.485 and the number of shares used in our calculations is 105,000,000 units. 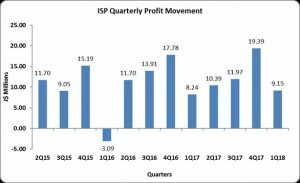 ISP’s stock price last traded on May 15, 2018 at $17.99. Total Stockholders’ Equity as at March 31, 2018 was $295.42 million (2017: $242.26 million), resulting in a book value of $2.81 (2017: $2.31) per share.